You may receive updates from Gus Hernandez, the creator of this petition. 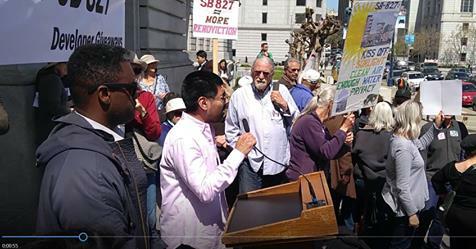 On April 4, on the steps of San Francisco’s City Hall, we and other representatives from more than 40 San Francisco community organizations joined together for a lawful and fully permitted press conference to express concerns regarding the negative impacts of SB 827. Our speakers included representatives from across the city including the Mission, Excelsior, Chinatown, Western Addition, the Northside and Westside. We included tenants, homeowners, seniors, environmentalists, and communities of color. Our intention was to raise concerns that SB 827 would exacerbate displacement, undermine our affordable housing policies, and strain our overburdened transit system. We particularly sought to bring to public awareness that SB 827 would eliminate the opportunity for the voices of disadvantaged communities to impact policies that have a direct and immediate impact on their lives. But we were denied the opportunity to speak by the deliberate, concerted, and continuous disruptive actions of the Yimby organization which is alsothe sponsor of SB 827. As has been described in media accounts including the San Francisco Examiner, a Yimby contingent including leadership of the national and state organization, shouted down our speakers and disrupted the event to the point no one, including the assembled reporters, could hear our speakers. As a direct and foreseeable consequence of the Yimby action the press coverage of the event has centered on the disruption and not the content of our messages. As the principal author of SB 827 and a close collaborator with the local and state Yimby organization locally we ask you to condemn all Yimby networks’ efforts to suppress public critique of this legislation. It is not enough, as Yimby spokespeople have assured, to change their future disruptive actions to not interrupt speakers if they are “low income people of color.” The Yimby organization needs to cease silencing critique by any and all people. We believe that this position should extend to the consideration of SB 827 itself. It is no coincidence that the sponsors of SB 827 sought to deny our communities the ability to raise concerns about a bill that would institutionalize the suppression of community voices, participation, and dialog. As written SB 827 is a deeply divisive and disrespectful proposal. As has been noted by community organizations in Los Angeles, San Francisco, and throughout California, SB 827 will undo the efforts of hundreds if not thousands of community organizations to improve the livability, sustainability, and affordability of their neighborhoods. Exclusionary practices that suppress the development of truly inclusionary housing need to be challenged. But it is fundamentally wrong to then conclude that all community plans are exclusionary and should be overridden by state law. Yet that was the claim of the Yimby chants interrupting our press conference and also the underlying assumption of the legislation itself. For all these reasons we demand that you denounce Yimby disruptive practices and we ask you to put SB 827 on hold until there is the room for the dialog that all our communities deserve. We demand that you denounce Yimby disruptive practices. SB 827 has the potential to cause harm to vulnerable communities and to the environment. We ask you to put SB 827 on hold until there is room for the dialog that all our communities deserve.